In Trash To Treasure Part 1 I talked about upcycling glass jars and bottles. There are so many creative things you can do with them and in the description box below the video (click where it says Show More) there will be links to my video tutorials for the projects I share. And it Trash To Treasure Part 2 I talk about upcycling cardboard food containers like cereal boxes, cracker boxes, pizza boxes, and even toilet paper rolls!!! And just like with Part 1, there will be links in the description box below the video (where it says Show More) so you can watch my tutorials on the projects I share. 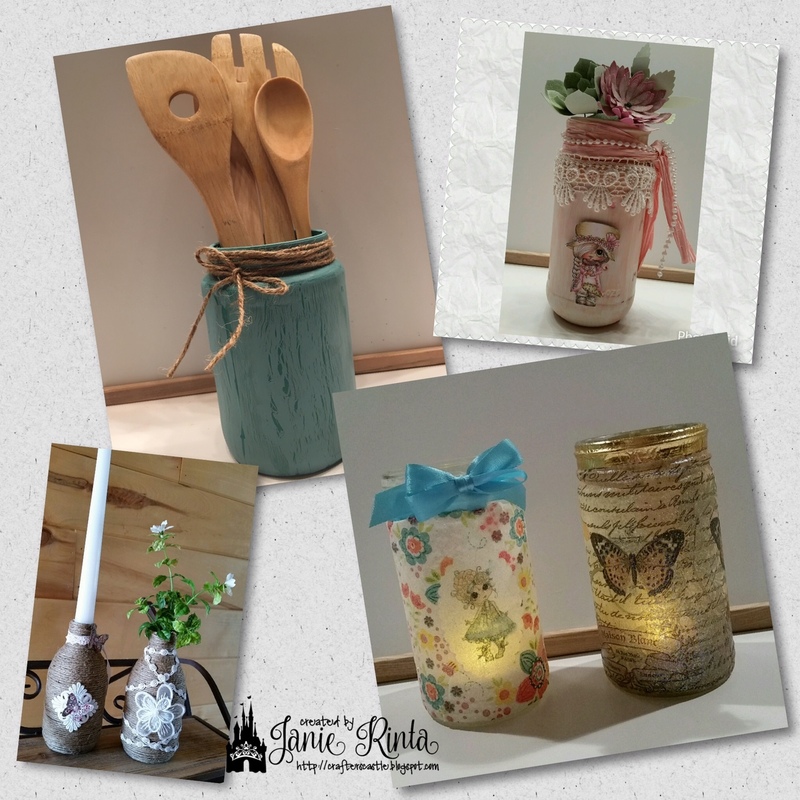 If you enjoy upcycling or want to learn how to start, you will love these videos. 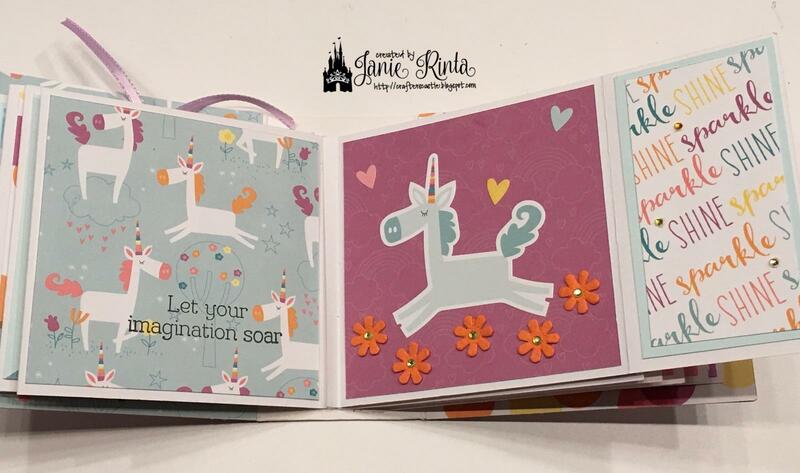 They are full of wonderful ideas that are easy to do...and maybe they will give you some ideas of your own. And don't forget, below each video in the description box are links to my tutorials on these projects. 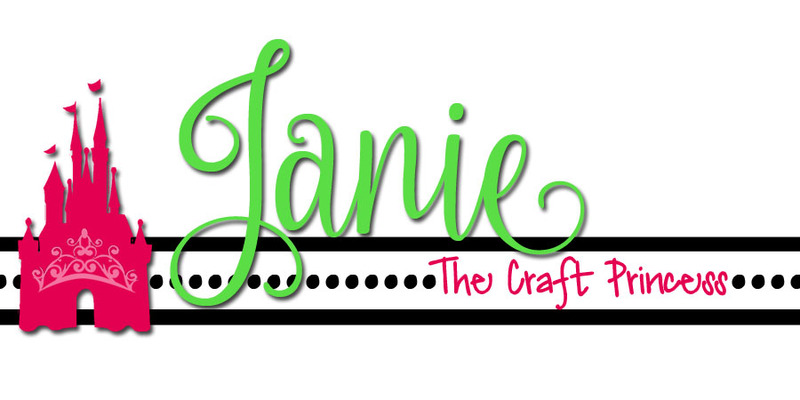 Most of what I do you will find on YouTube....but sometimes I just need to create without a camera. Sometimes what I do takes days of thought and creativity. This is one of those projects. So I will do my best to explain this here in writing. then it's is my 3rd mixed media project. First I did a paint pour on an 8x10 canvas (using Valspar interior paint) in shades of pink and white....there isn't much contrast but I got the look I was going for. The metal filigree corners are from Creating With Details , and the antique key I got on ebay. The Paris postcard (digital) is from VectoriaDesigns Etsy store, I inked the edges with "Vintage Photo" Distress Ink. The tiny butterfly is from a punch. I added lace (from Michaels), and flat back pearls (From Creating With Details), and paper flowers (from Amazon). I stamped a ribbon and added that too. 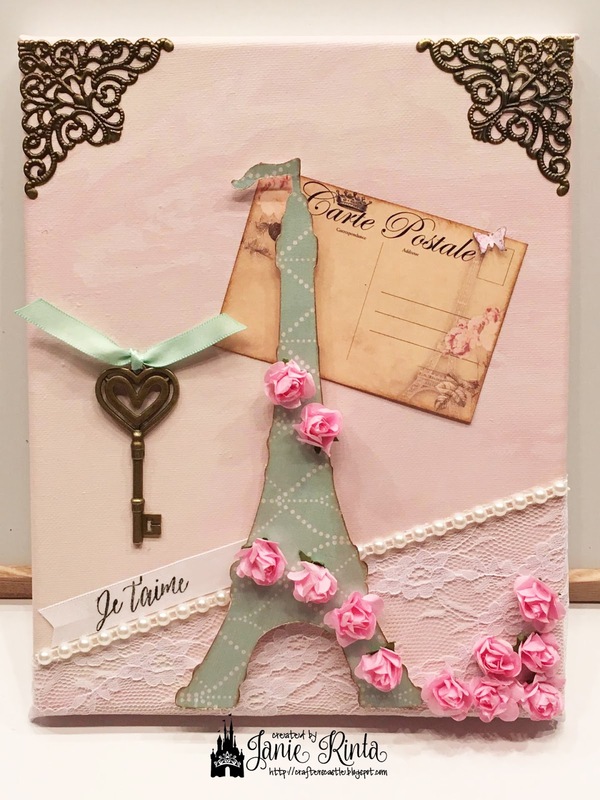 For the Eifle Tower I used spray adhesive to attach a patterned paper to a piece of cardboard from a cereal box and cut it out with my Cricut, gave the edges a distressed look with "Vintage Photo" Distress Ink, then used adhesive foam tape to "pop" it up over the other elements. To learn more about upcycling cardboard food containers watch my video Trash To Treasure Part 2 (this link won't work until Sept. 22). 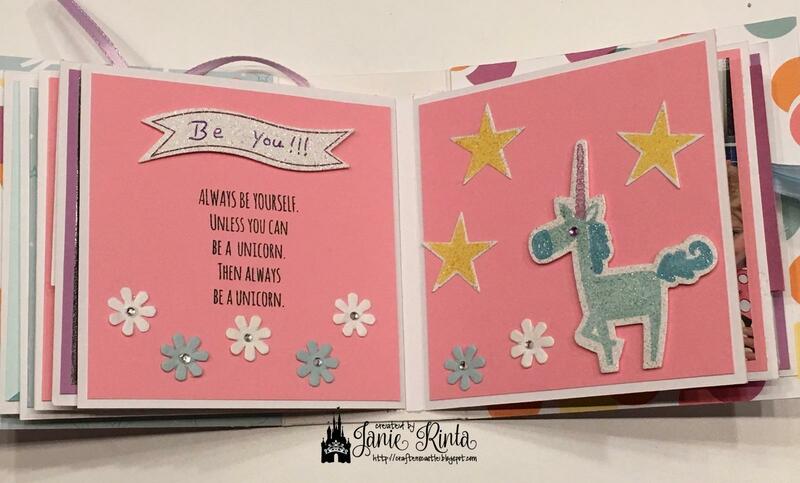 I hope this inspires you to try some fun things and make your own beautiful creations. Craft Rocket Challenges - #41 Beginning With "F"
Craftyhazelnuts Patterned Paper Challenge - Sept. If you all haven't noticed, I'm really into upcycling and using trash to make beautiful creations. This is just another one of those creations. I started off with a cracker box and turned in into this! and how to attach the pages to the binding. I made this adorable shaker for one of the pockets. 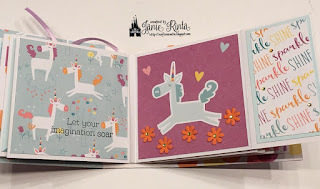 This album is also filled with pages that have pictures on them, but you can put whatever you want on them. It would even be a nice junk journal. It would also look great if you made it Shabby Chic or Vintage or Elegant or Masculine. Use your imagination to create it anyway you want. and this link will take you to the search page with everything on it. DOUBLE Easel Cards - Super EASY!!! 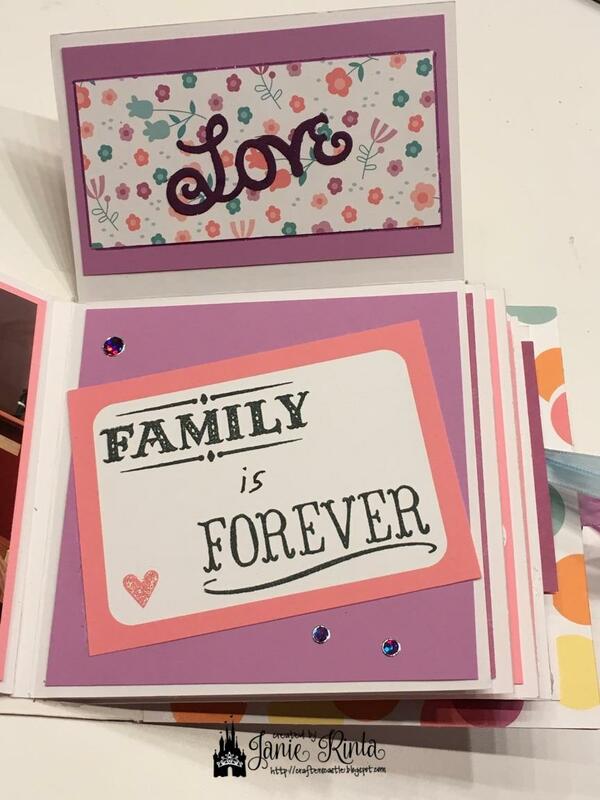 I love easel cards...but...I love Love LOVE DOUBLE easel cards!!! They are so easy for beginners that don't have many tools...AND...there are so many possibilities for advanced cardmakers, like using dies and tons of embellishments! 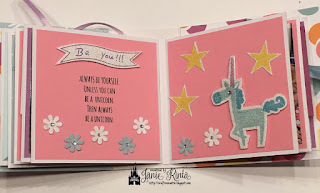 CLICK HERE to watch my tutorial on making these cards! For beginners, this one can be made without a score board or dies. Yes, I did use stitched dies to cut the oval and the tiny heart....but you can use other things like a button or embellishment of some sort in place of the heart (or any shape). 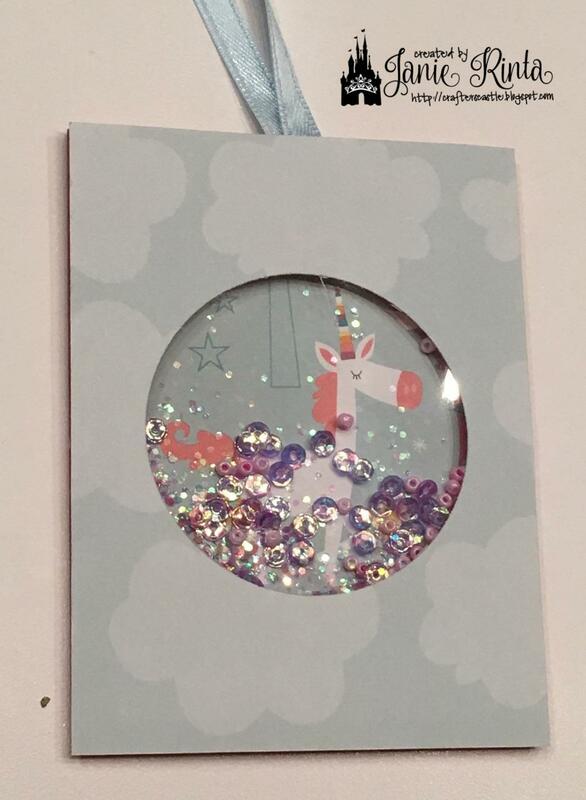 And in place of the oval with a stamped and colored image you can use a pre-colored image and cut any shape you want. I used my Anne Of Green Gables stamp and colored it with colored pencils. I also added some flowers....I thought they were really the perfect touch. This one might be for the more advanced cardmaker. 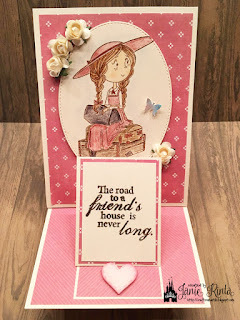 I used heart shaped dies and one of my favorite Gorjuss Girl stamps. I colored the image with colored pencils. I used my favorite colors...PINK & GREEN. 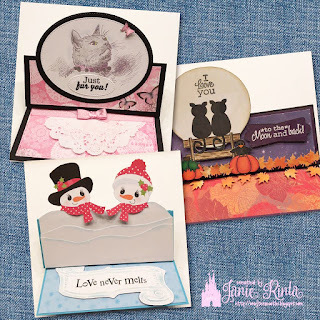 In my video I show how to do partial die cutting to make shaped cards. 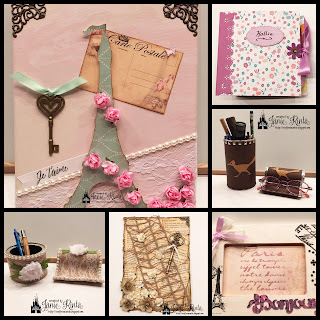 HLS Anything Goes With Dies - Sept.
Pop-up Easel cards add that extra something special to a regular easel card and I just love them. There are so many ways to add the Pop-up to create different looks. I made a tutorial video that shows the basic easel fold even if you don't have a score board...and how to attach the pop-up element....including how to attach things like the snowmen. 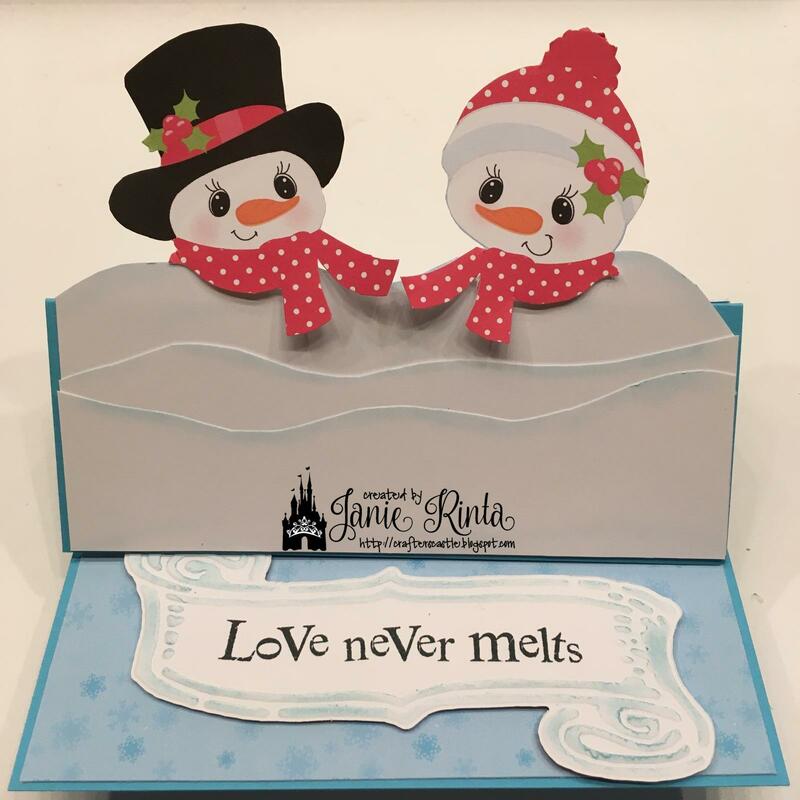 I loved making this one with the snowmen popping up! To see what it looks like closed just watch my video....I'm really sorry but I forgot to take a picture of it closed. For the snow I just tore white cardstock in 3 different heights and chalked the edges with a light blue. The blue snowflake digital paper and the clip art snowmen are from AMB Illustrations . Here are the links to Christmas Paper AMB 512 and to Christmas Faces AMB 197. 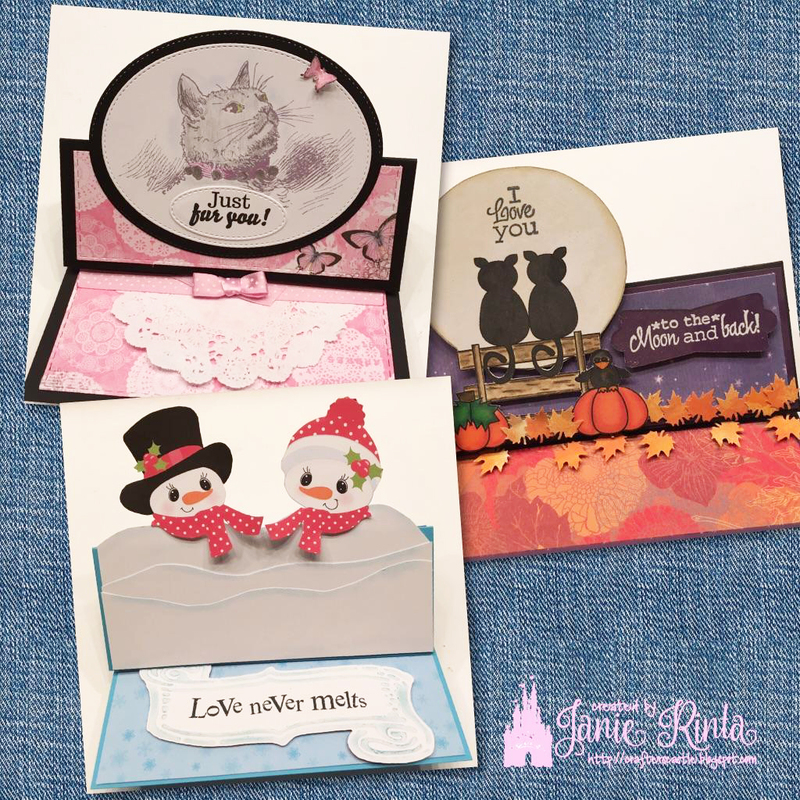 The scroll is a Cuttlebug die cut, and the "Love Never Melts" is from a CTMH stamp set. 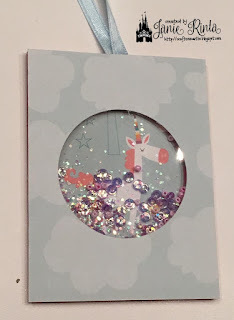 Craftyhazelnuts Christmas Challenge Extra - Sept. 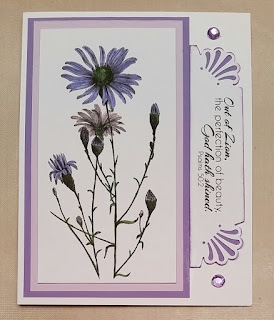 There are times when you need a special card to express your feelings.....and these beautiful flowers and sentiment were perfect! 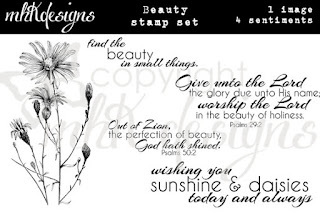 They are from the "Beauty" digital stamp set by MHK Designs. I colored the flowers with Spectrum Noir markers and kept everything in shades of purple for a monochromatic look.